In Australia the market was lower on Tuesday, with the ASX200 closing down 40 points at 5669, with investors un-nerved by the North Korean missile test which flew over Mainland Japan. A risk off stance saw weakness in most sectors, although resources were notably higher. Gold stocks were on the bid, with the All Ords sub-index rallying 2.6%. 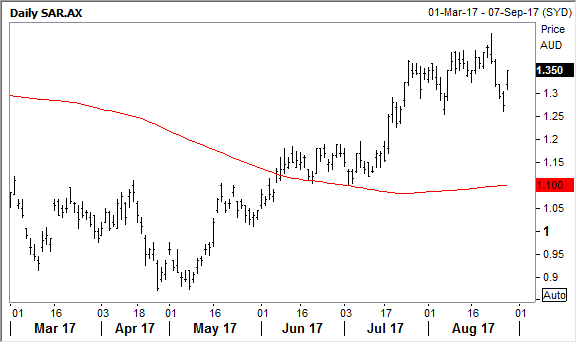 A rally in copper to three year highs overnight should also provide some support for resource stocks today. Inventories in London and Shanghai fell while weakness in the US dollar has provided a boost. 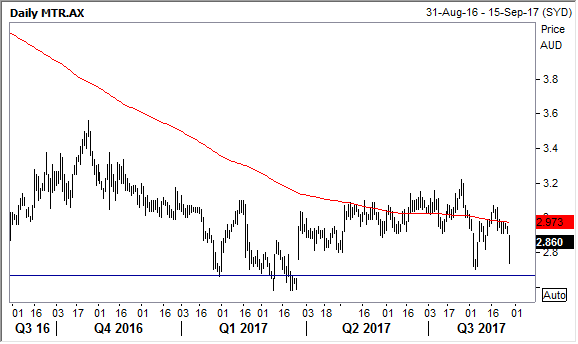 Benchmark copper jumped 1.9% to close at US$6791.50 tonne a tonne, and had touched US$6843.50, a level last seen in September 2014. Whether we have reached ‘Peak Fear’ as it relates to North Korea is not clear, although clearly gold will be one safe haven that will benefit when risk is taken off the table. We saw this in yesterday’s session with Newcrest posting a gain of 2.2%. We have favoured the higher quality producers, and Saracen (chart below), which has been recommended by our analyst team, was one of the standouts, rising almost 6%. I also continue to like the leverage which Evolution has, with production and costs going in the right directions – the shares rose 1.3% on Tuesday. The banking sector was weaker as well, and CBA shed a further 1.2% to close at $75.73 on Tuesday. As I have been saying, the money laundering allegations could well undermine sentiment for some time, and I think we will continue to see the bank’s historic premium to peers dissipate. The stock has already lost its mantle as the biggest company in Australia by market cap, and has been usurped by BHP Billiton. Mantra Group’s result was released on Tuesday, with net profit after tax rising 14.2% to $47.2 million. The number though was below February guidance of $48.5 million to $52.5 million, and saw the shares close down 2%, after falling as much as 6% during the session. I thought the result was actually a reasonable one (pre-tax earnings of $101.2 million was at the bottom end of guidance), given the challenges faced following the Dreamworld catastrophe which impacted the Gold Coast business, along with the disruption caused by Cyclone Debbie. The resorts division was a strong perfomer, with revenues rising nearly 30% to $316.2 million. There should be further growth here medium to longer term, and with the Commonwealth Games on the horizon next year. I also think that a strong A$ (versus the US$) is less of an issue than many would suggest. 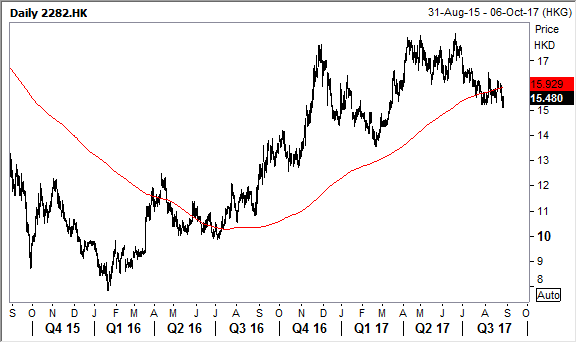 More relevant to Australia’s main tourist markets are the renminbi, yen, and Kiwi dollar, which have been more stable on a relative basis. Organic growth is also being augmented by some good acquisitions which are boosting scale and earnings growth potential. Group revenues rose by $82.9m, or 13.7% t, to $689 million during the year, bolstered by the purchase of six hotels. The company’s recent acquisition of the 1176-room Ala Moana hotel in Hawaii also looks to have been a good call, with the asset performing strongly. The key markets of Sydney, Melbourne, ACT, and Sunshine Coast performed well, with occupancy levels improving. I also thought it was telling that the company has been able to push through room-rate rises. This is significant given that much has been made of the disruptive risks posed by the likes of Airbnb. We have consistently said that the across the board quality of Mantra’s properties, and branding, are key differentiators. There are certainly some pockets of weakness, and notably the likes of Perth, Brisbane and Darwin, although again, if we are right on the resource sector turning around, these regions should improve. Looking ahead I also think that Mantra will benefit from a robust development and acquisition pipeline. The company is focussed on further expansion in Australasia, and recently acquired more than 1000 rooms with the Art Series hotels for $52.5 million. There is also the potential to acquire any new hotel developments under the Art Series brand. The Gold Coast will though be the key market for the company medium term with the Commonwealth Games in April next year. The region accounts for almost a quarter of the company’s 16,500 hotel keys under management, and as CEO Bob East notes ‘will be pivotal to Mantra delivering operating earnings in the current financial year at the higher end of its forecasts of $107 million to $115 million.’ Game on! The game though looks to be up for Ten Network with US company CBS set to take-over the company. Terms have not been disclosed, but it would appear unlikely that there will be anything left on the table for shareholders, and we are now hearing suggestions of a class action following the network’s entry into administration. The deal also rules out a takeover by a consortium led by Lachlan Murdoch and News Corp.
CBS knows Ten well, with the company being its biggest customer in Australia, and plans to launch its streaming service in the country. Content is clearly king, and it just very sad that management have not been able to leverage this successfully or commercially over the years. With only a couple of days before Macau’s August gambling revenues are reported by authorities, the Macau casino operators traded modestly higher yesterday. Of our direct exposures via holdings in the Global Opportunities and Asian Managed Account Portfolios, MGM China (chart below) led the way with a 1.84% gain, followed by Wynn Macau at 1.80% and Sands China with a 1.32% gain. This was after all the casino operators had earlier taken a small knock in trading linked to the disruption from Typhoon Halo. That saw Morgan Stanley reportedly revise downwards its August gross gaming revenue growth estimate from 24% year-on-year to 18%. Still, all our Macau gaming exposures (including Nasdaq-listed Wynn Resorts) have been strong performers since we began establishing positions when sentiment was at a weak ebb and VIP players were yet to return to the gambling hub. However, our thesis was that the shift towards a more family-friendly environment would eventually see millions more mass-market players attracted to the region. 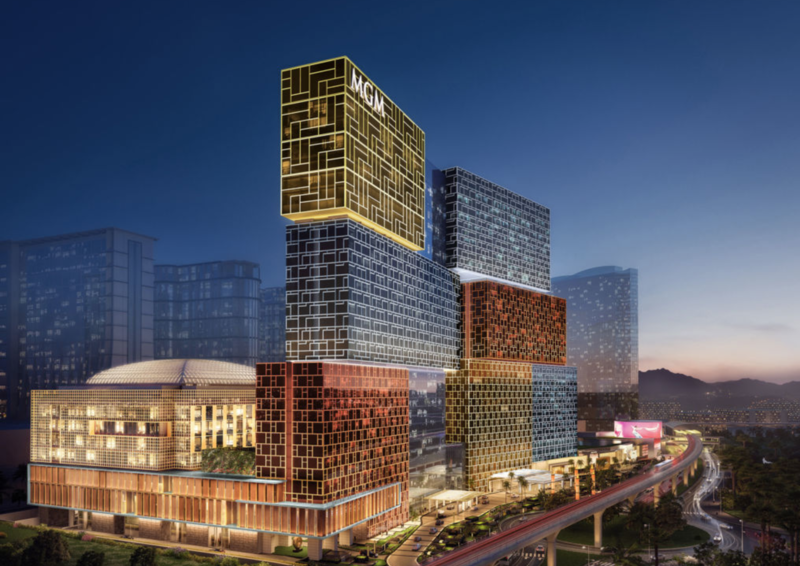 We believe we are still relatively early in seeing that story playing out and the Macau mass-market should continue to grow. New properties with world-class entertainment and improved transport infrastructure will draw punters from a growing pool of Mainland Chinese consumers with passports and the financial means to travel and enjoy new experiences. Mass-market players tend to be more lucrative for casinos over the longer term, barring some periods where the casino benefits from an exceptional win rate (the luck factor) with VIP players. Most expect gambling revenue in Macau to quickly bounce back from any negative impact from Typhoon Halo, which with winds of over 200 kilometres an hour caused power cuts and some damage to resorts and saw the tourism bureau recommend the suspension of some group tours. Macau has been on a roll this year, with Macau gambling revenue rose 29.2% year-on-year in July to 22.96 billion patacas (~US$2.85 billion). This marked a full year of that gross gaming revenues exhibited year-on-year growth with the momentum picking up in 2017. This backdrop bodes well for the local casino operators. The July gambling revenue increase was the biggest in year-on-year terms since early 2014. Macau’s year-to-date cumulative gross gaming revenues (GGR) of 149.3 billion patacas after the first seven months of the year is some 18.9% higher than in the comparable period of 2016. Disclosure: The Fat Prophets Contrarian Fund declares a holding in Mantra, BHP, MGM China, Wynn Macau, Sands China.